Altaria in game: 511 Who? Important notice! Pokemon Altaria is a fictional character of humans. Altaria's first major role was in Sky High Gym Battle!. Ash's Grovyle battled against one in Ash's Gym battle against Winona, the Gym Leader of Fortree Gym. An Altaria belonging to Drake of the Hoenn Elite Four appeared in Vanity Affair where it battled against Ash's Grovyle. Another flock of Altaria and Swablu was seen in Pokémon Ranger - Deoxys' Crisis! (Part 1). The Altaria's sense of direction had gone haywire, so Solana captured one of them to put them back in order. Grandma Wilma was training an Altaria that appeared in A Meteoric Rise to Excellence!. An Altaria under the ownership of Nando appeared in Last Call — First Round! participating in the Performance Stage of the Sinnoh Grand Festival. It performed along with a Kricketot and helped Nando advance to the Contest Battles. Two Altaria appeared in the flashback in Drayden Versus Iris: Past, Present, and Future! : one as a Pokémon students from the Opelucid Academy could borrow to learn how to battle, and the other as one of the Pokémon Iris befriended. 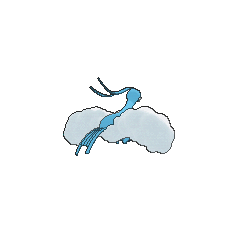 A Trainer's Altaria appeared in A Relay in the Sky! participating in the Pokémon Sky Relay. An Altaria appeared in A League of His Own! under the ownership of Titus. It was used in the Lumiose Conference, but was easily defeated after Ash's Greninja transformed into Ash-Greninja. Altaria first appeared in Jirachi: Wish Maker. 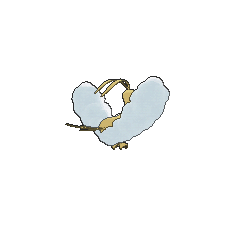 It was one of the Pokémon that lived in Forina, Jirachi's home. 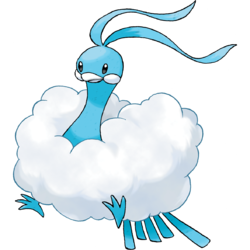 There were some Altaria in the flock that an injured Swablu belonged to, in True Blue Swablu. Altaria appeared in the opening of Destiny Deoxys. Altaria had a cameo appearance in Lucario and the Mystery of Mew. 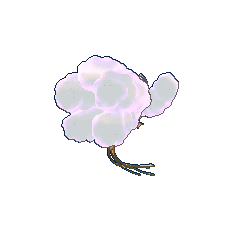 It could be seen in a flock with some Swablu, living in the Tree of Beginning. A group of Altaria, Sentret, Furret, Shroomish, and Swablu helped Pokémon Ranger Jack Walker when he was a young boy in a blizzard as seen in a flashback in Pokémon Ranger and the Temple of Sea. An Altaria appeared in Not on MY Watch Ya Don't! under the ownership of a Coordinator. Multiple Altaria made a brief cameo in Giratina and the Sky Warrior. Multiple Altaria appeared in Butterfree and Me!. Winona of the Fortree Gym has an Altaria as her main Pokémon, much as in the games. 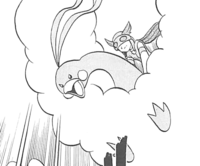 It was briefly seen carrying Winona and Flannery to the Weather Institute after Norman's battle with Ruby, but wasn't seen fighting until I Dare Ya, Altaria... Knock Chic off My Shoulder, where it fought Sapphire's Chic and managed to win even after the latter evolved into a Blaziken. Lisia also owns an Altaria nicknamed Ali. 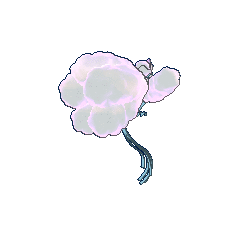 In PAORAS04, a Altaria was silhouetted in Steven's explanation about the Draconid people. 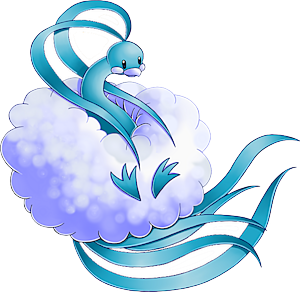 An Altaria appeared in PAORAS16 under the ownership of Wally. 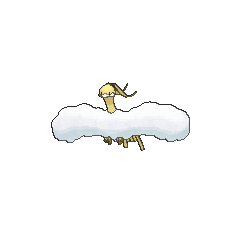 Altaria hides by summoning dense fog. It flaps its wings to compose gusts. Altaria has the lowest Attack base stat among all fully-evolved Dragon-type Pokémon. 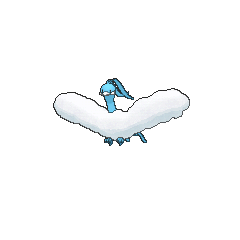 Altaria is also tied with Kingdra for the lowest base HP of all fully-evolved Dragon-type Pokémon. It is also the only Dragon-type Pokémon immune to Dragon-type moves, as well as the only Fairy-type Pokémon weak to Fairy-type moves. Altaria is the quickest Dragon-type Pokémon to level up, needing only 600,000 experience points to reach level 100. Altaria is the only Pokémon to have two Prerelease cards. Altaria is likely based on Peng, Chinese legendary birds of enormous size, said to travel 3000 li in one flap of their mighty, cloud-like wings. They're often portrayed as having a fish's head and whiskers. 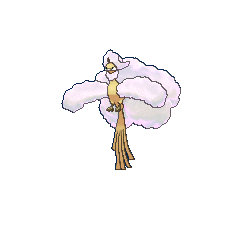 The shape of the fluff on Mega Altaria's head may draw inspiration from Dutch caps. 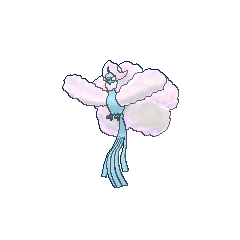 Altaria is a combination of alto (Spanish and Italian for high) or altus (Latin for high) and aria (Italian for air). Aria in music can refer to expressive melody, relating to Altaria's singing abilities. It may also refer to the star Altair, the brightest star in the constellation Aquila, the Eagle.